"The Silkworm" is the sequel to Robert Galbraith's (JK Rowling's) "The Cuckoo's Calling." This book series is really gripping and I hope more are released. I saw on Twitter that the BBC are making "The Cuckoo's Calling" into a drama...I can't wait. I am so happy Netflix have added Pretty Little Liars. I used to watch it on MTV/4 music when it first started and then they stopped showing it in the UK. I am now on season 5 and totally glued to it. They upload a new episode every Wednesday. I got my hair cut and coloured at the weekend and I love it. I also bought MAC Creme Cup lipstick and I think it's my new favourite shade. I received Lush's "sugar scrub" bar for Christmas and I love it. It is full of fennel, lavender and ginger which makes my skin so soft. (I used it up before I could get a photo). My favourite mascara used to be Urban Decay's "Supercurl" until I discovered MAC's "In Extreme Dimension" mascara. 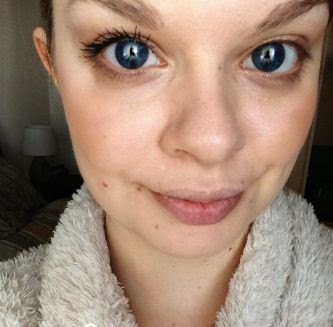 I know that a lot of people rave about Benefit's "They're Real" mascara but it is not for me. I find that Benefit's mascaras have a wet consistency and they smudge. I got MAC's "In Extreme Dimension" mascara in the Holiday 2014 Keepsakes plum eye bag. It is the best mascara I have ever used. 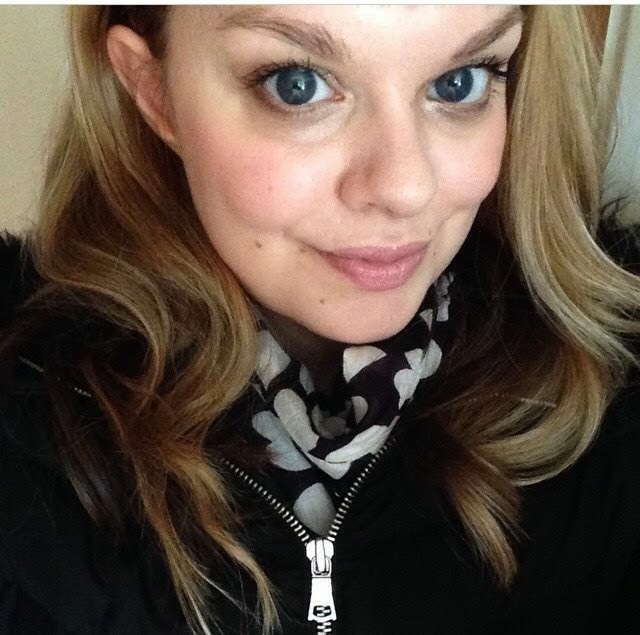 In the photo above I am only wearing one coat of the mascara and as you can see my lashes are already considerably longer than those without. It doesn't clump my lashes together and even manages to separate the tiny lashes. The mascara is a lovely dark black colour and it doesn't flake or smudge on to my skin. From my experience this mascara lasts 10 hours+ and only comes off then because I am removing my makeup at the end of the day. I love reading "what's in my bag" posts. 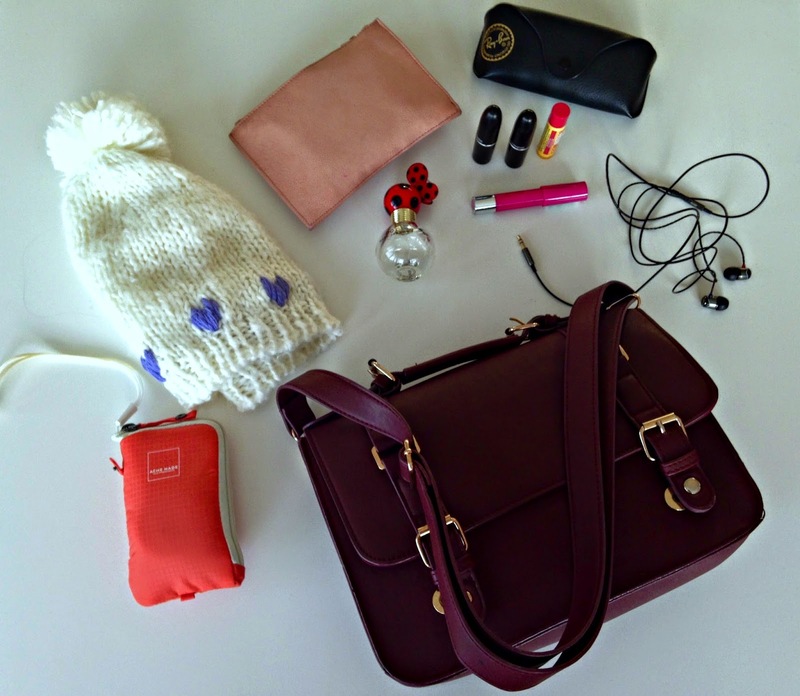 My everyday bag is from Accessorize and is a gorgeous oxblood colour. I also used to have this bag in yellow, burnt orange and blue. Accessorize is my favourite place to get reasonable priced satchels from. I keep my Samsung camera in my bag so when I am out and about I can take good quality photos. I'm not sure where my hat is from as it was a gift but I love it. It's slouchy and cosy, definitely an essential with the windy Aberdeen weather. My purse is from Accessorize. I originally bought this one because it fit perfectly in my Mulberry Lily bag, the colour also matched. I have a mini bottle of Marc Jacobs Dot. It is one of my favourite perfumes. I have my Ray-ban's in the my bag because SOMETIMES it actually is sunny in Aberdeen. I love my sunglasses so much and I think that Ray-ban's suit everyone. I have a Burts Bees pomegranate lip balm in my bag as this winter my lips have been super dry. I have three lipsticks in my bag. 1. Revlon Just Bitten stain in "Lovesick" 2. MAC "Angel" 3. MAC "Creme Cup"
Finally in my bag I have my earphones. I always listen to my Spotify playlists when I am walking somewhere. 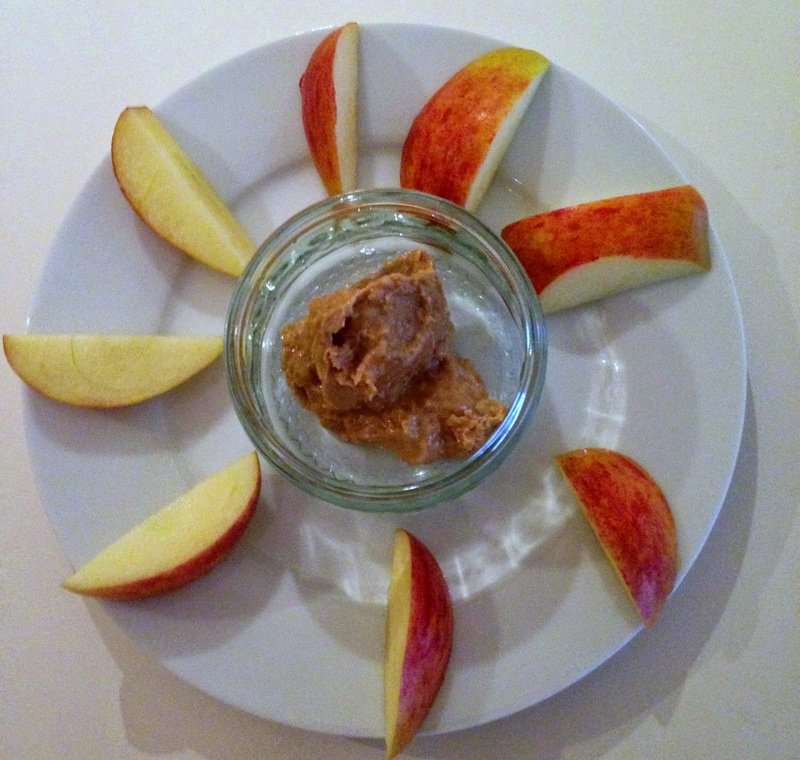 I love chopping apple up into wedges and dipping it in peanut butter. My favourite peanut butter is the crunchy stuff by Whole Earth Foods but their peanut butter with sunflower seeds is also delicious too. 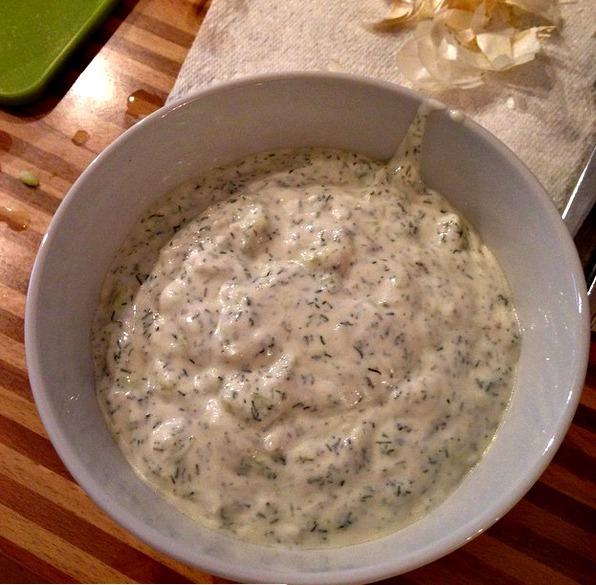 I could eat hummus every day and I really need to make my own one day. I like to eat hummus with carrot sticks. Peppers and celery are good as well. Another favourite sweet treat of mine is fruit with Greek yogurt and honey. The fruit combo I like best is banana, blueberries, raspberries and strawberries. Sometimes I will have this in the morning too with oats to make it more filling. I am a big fan of Nakd bars and recently discovered their new products, Nakd Bits. My favourite kind is the cocoa orange. They're made from dates, cashew, raisins, cocoa and orange. They also have berry delight bits which I think would be nice as well. I think dates are amazing. To me they taste caramelly. They are quite sweet so I find I don't need too many to satisfy me! 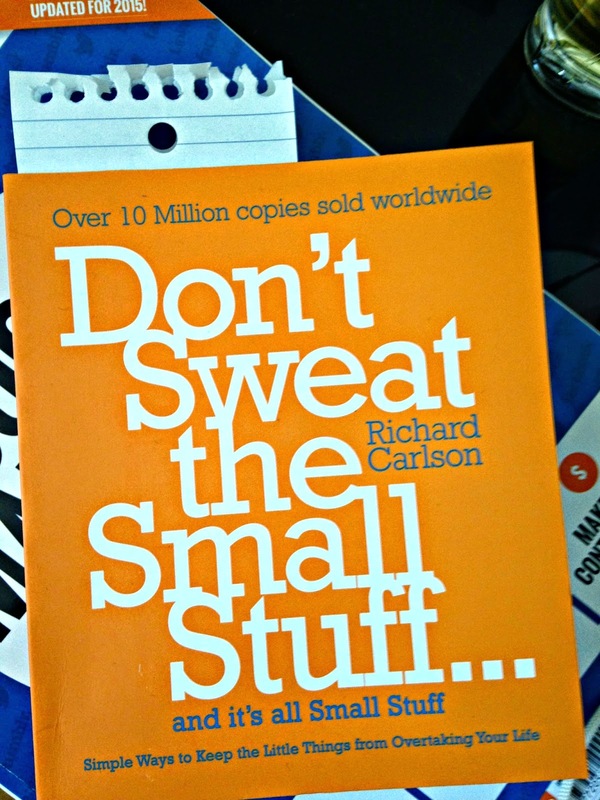 I can be a bit of a worrier so when I was in Waterstones a few weeks ago I bought this book. It has got some really great points in it and I am enjoying reading it. I am a big fan of coconut so was excited when I saw this in the supermarket! 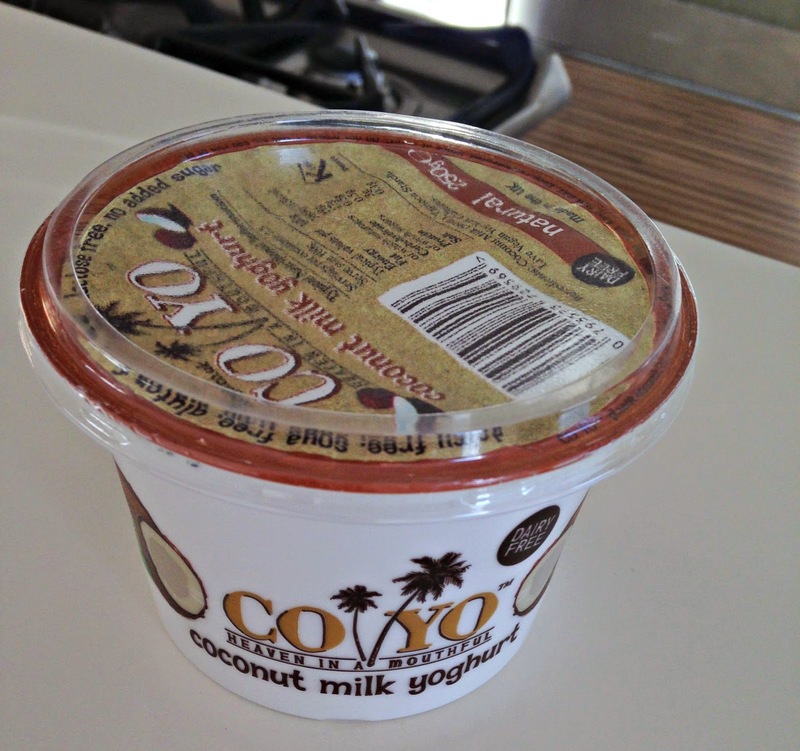 This yoghurt is suitable for vegans and is lactose/dairy free, soya free, gluten free and nut free! The fat content is high at 19g but I think it is ok to have as a treat. 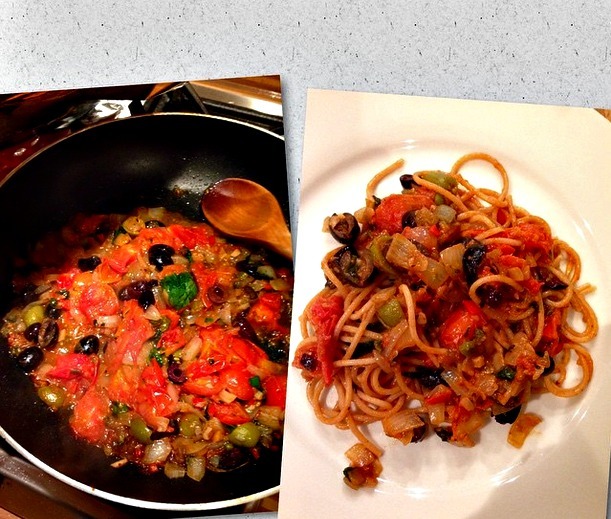 I was on the lookout for more recipes and downloaded the Deliciously Ella app. 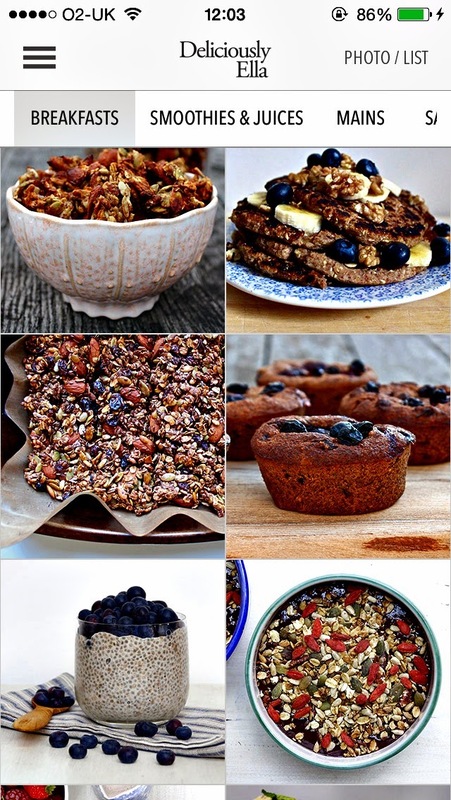 It has loads of different categories full of healthy and easy recipes. The layout of the app is really tidy and I love the photographs of the food. 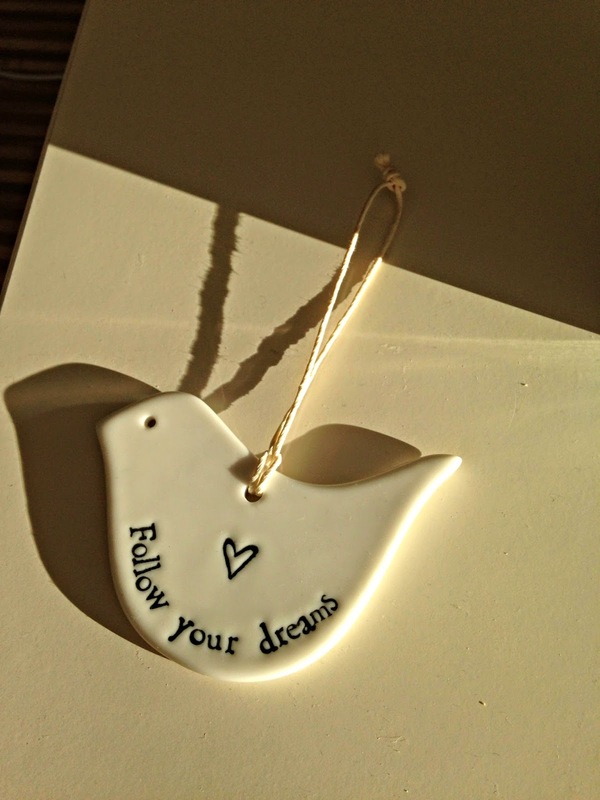 This dove trinket that my mum bought me is really cute. I went to the cinema to see The Theory of Everything and I am so glad I did. 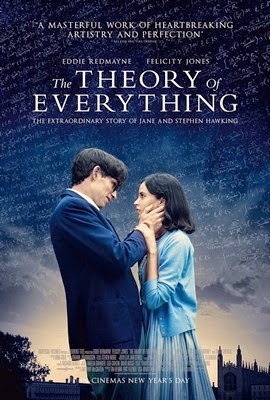 Eddie Redmayne was brilliant as Stephen Hawking. He really deserved the Golden Globe award and I am sure he will have many more awards to come. I really recommend going to see this film. Maybe bring some tissues, I definitely wasn't emotionally prepared! As well as reading blogs, I also enjoy spending time browsing Youtube channels. I have built up quite a long subscription list but I thought I would share my favourite four with you. 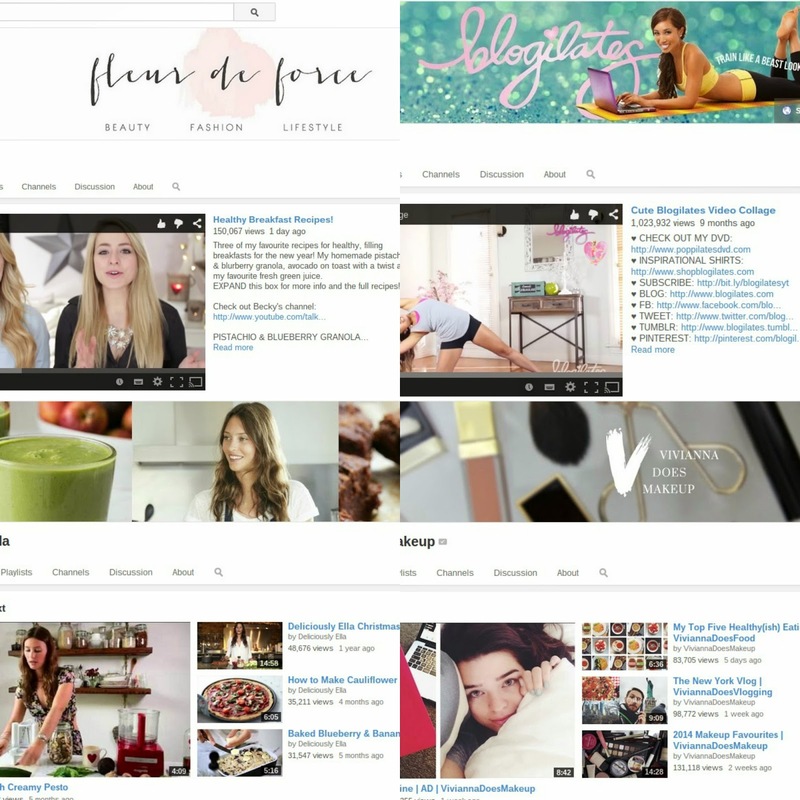 I love both Fleur's review channel and her vlogging channel. 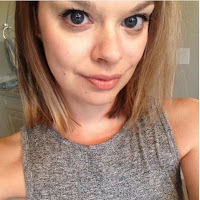 I love that the products she reviews are affordable and I feel that she is very easy to relate to. 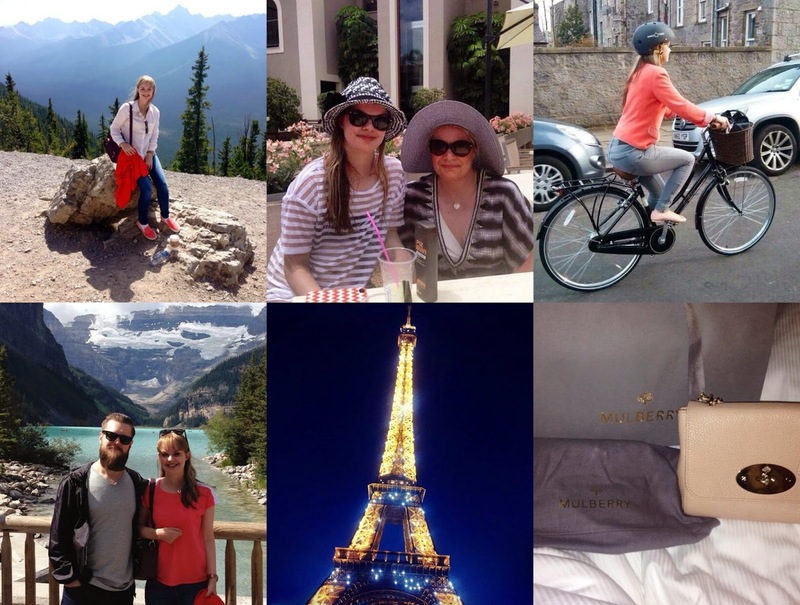 Fleur's Vlogmas was my favourite of 2014 and I enjoy her travel vlogs too. Casey's channel is my number one Youtube channel to use when I feel like I want a good workout. The workouts are pilates to pop music, also known as POP Pilates. Her bubbly personality really helps to push through the routines. Most of them are only a few minutes long but they really are tough. I am sure everyone is aware of Ella and her amazing recipes. Her recipe book is available from 29th January but until then you have access to her app and Youtube channel. Her recipes are all healthy and easy to make. She even has an almond milk recipe which I would love to try! I really trust Vivianna's makeup reviews and have discovered many great products thanks to her. Her channel also has a great combination of healthy eating, exercise and lifestyle videos. What's some of your favourite Youtube channels? 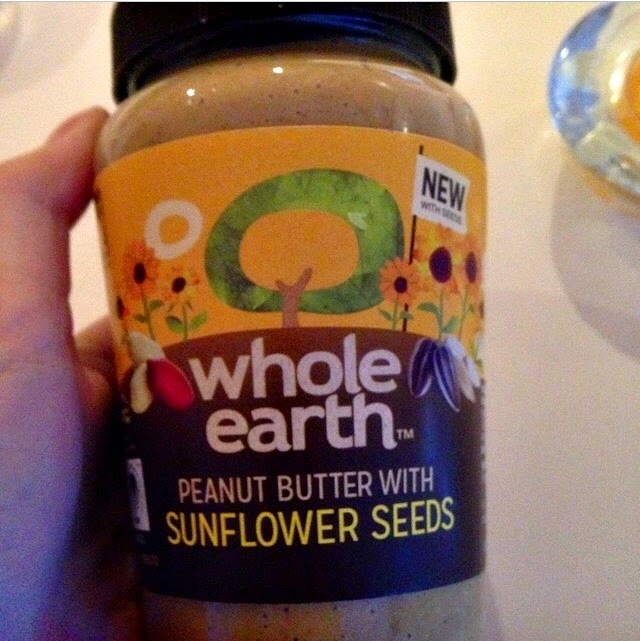 Whole Earth peanut butter is my favourite so I was excited when I saw this new creation in the supermarket this week. It is really good. They have also released peanut butter with sunflower, flax and pumpkin seeds. 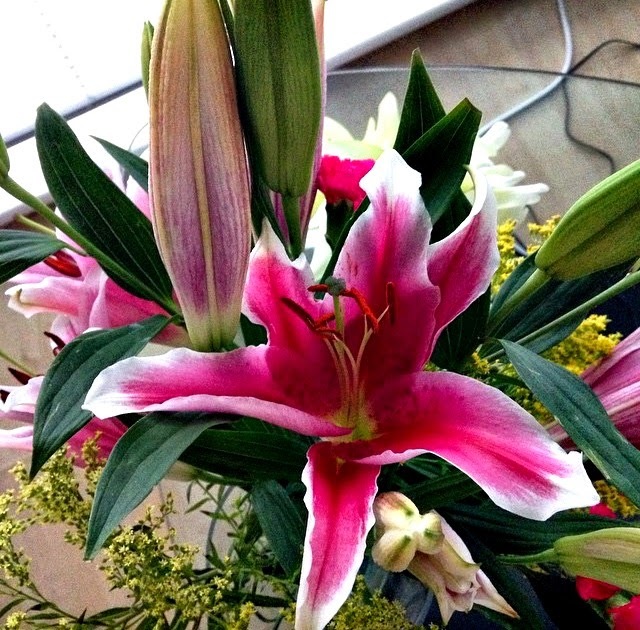 Lilies are one of my favourite flower types. These ones are really vibrant and pretty. 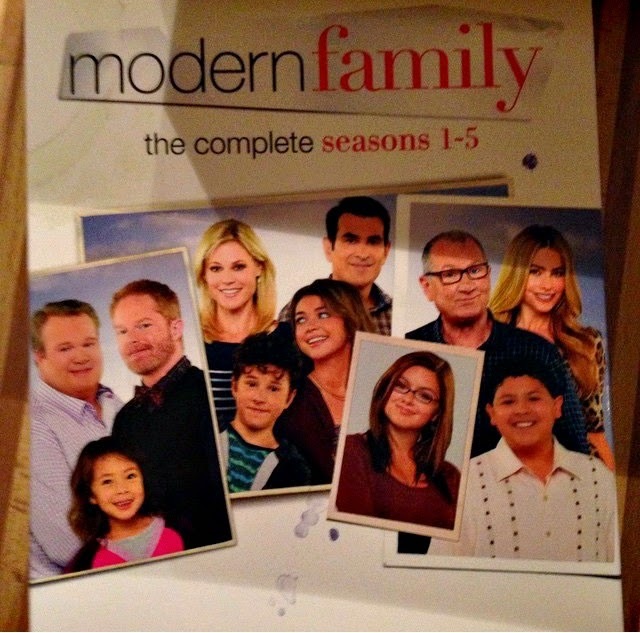 Been watching the Modern Family box-set since Christmas. It is hilarious and if you haven't seen it you should definitely watch it. I think everyone can find a character to relate to in it. Seen these magazines before for iPads etc but this is the first time I have seen it for social marketing. 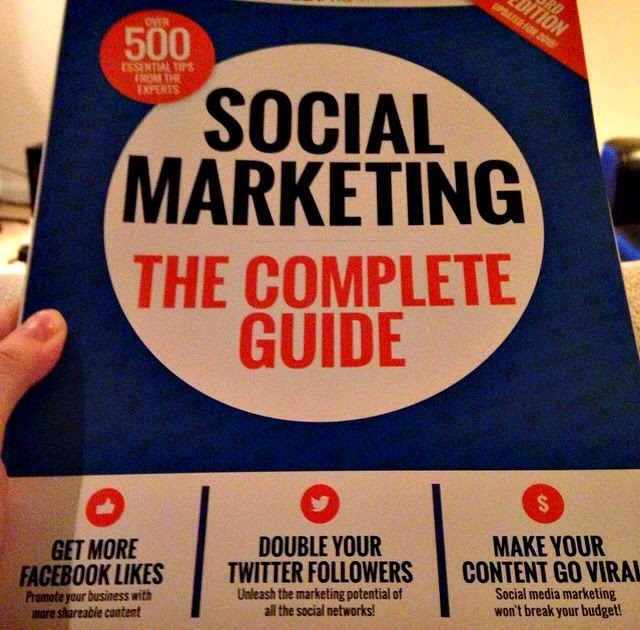 It is really interesting and has loads of tips for blogging and analytics. I got it from Tesco. 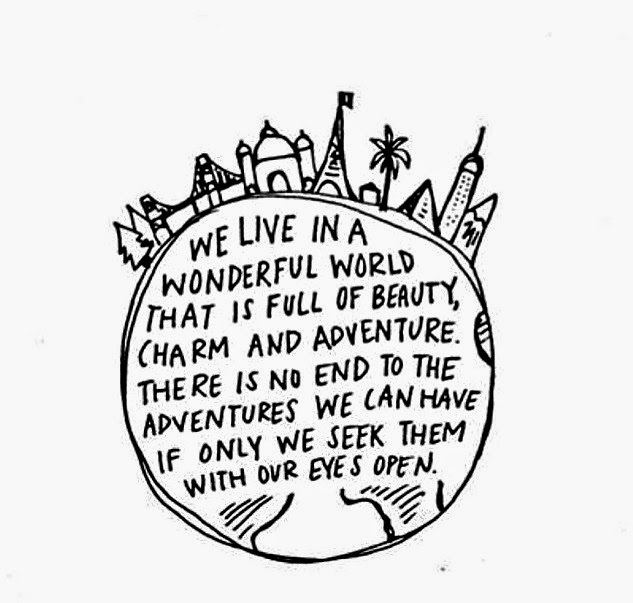 Saw this quote on Pinterest and really believe that it is true! 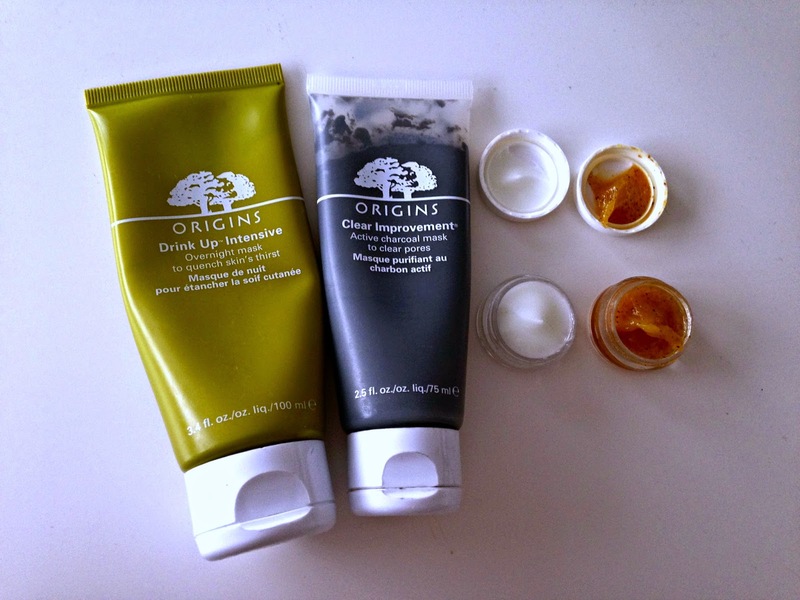 I first discovered Origins skincare products in 2013 when I read some blog reviews about them. I now use their products daily and I am going to share my favourite ones with you. I got this mask in a gift set that also included the Clear Improvement mask. The mask is full of avocado oil and apricot kernal oil which helps moisturise dehydrated skin. The scent of apricot is quite strong but I like it. It has a thick consistency and is advertised as an "overnight" mask. I apply it before going to bed and let my skin absorb it while sleeping. I use this mask normally twice a week, maybe a bit more in winter when my skin is more dry. I have purchased this twice now and it is one of the best masks I have ever used in terms of treating dry skin. Made up of activated charcoal, this mask helps pull out dirt from clogged pores. White China clay and Lecithin also helps to get rid of impurities. I don't use this mask too often, only when I feel like my pores are blocked. I leave it on for about 20 minutes. After using it my skin looks glowing and feels really clean. I love a good face exfoliator and this is the best one I have used. The apricot seeds, mango seeds and papaya in this scrub really exfoliate the skin and leave it feeling fresh. Unlike some exfoliators I have used before this one is gentle enough on the skin to use every day. This moisturiser is full of ginzing and coffee beans which help give the skin a glow. I find the consistency to be really light which is great as I don't like waiting ages for a moisturiser to sink in. It makes my skin feel really hydrated without making it feel or look oily. I also love the smell of this product. It really wakes me up in the morning! Have you tried Origins? What's your favourite products? In winter I can be prone to chapped lips but this routine helps keep them at bay. I start off by using a lip scrub, gently rubbing it on my lips to remove the dry skin. 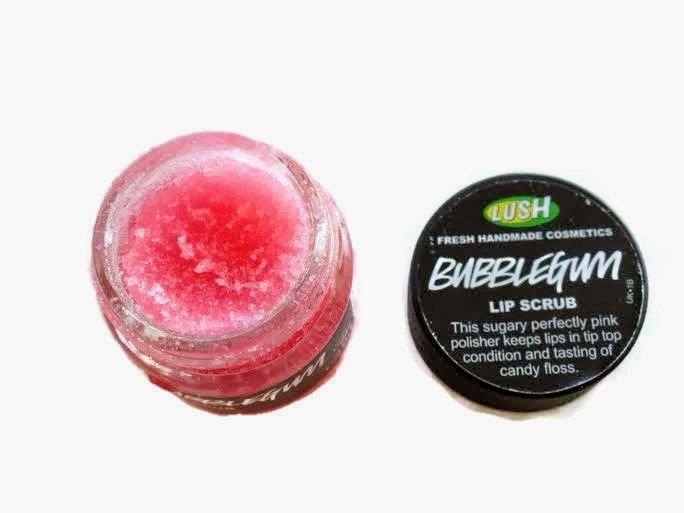 I am currently using Lush's bubblegum lip scrub. A few months ago I posted my own lip scrub recipe which you can find here! After using the lip scrub I use a lip balm. 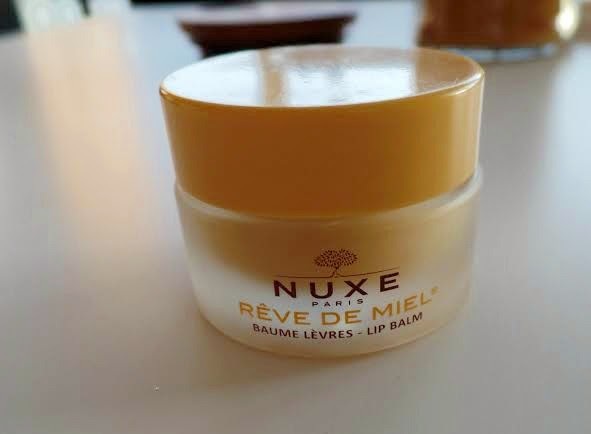 My current go-to balm is Nuxe which I bought while in Paris. In the UK you can buy it in Marks and Spencers. The lip balm is packed with honey, plant oils, shea butter and grapefruit essence. Their main selling factor is that in November 2009, the lip balm was tested in Canada in extremely cold conditions and 96% of people felt their lips were repaired and 91% nourished. I find the formula of the lip balm to be quite matte and really moisturising. My lips feel extremely soft after using both the scrub and balm. I do this routine before I go to bed and when I wake up in the morning. 2014 was a great year and I have lots of happy memories to look back on. I have decided to create a list of attainable goals for 2015 and to share them with you! Have you made any goals for 2015?